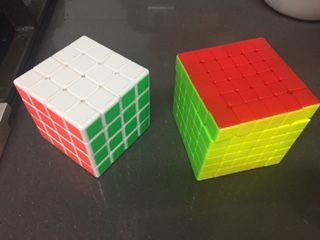 The New QiYi MoFangGe WuHua is a compact 67mm high-performance competition grade speedcube. Its smaller design frame allows for faster turning whilst enlarged outer pieces improve stability and performance when you reach the 3x3 stage. A new multi-level lock system above the core ensures chances of popping is greatly minimised. I like that the cube moves well and it is not too large for my hands. Well turning cube with decent corner cutting. With lube, re-tensioning and breaking it it has turned out fantastically. My only complaint would be the lock ups when attempting almost any level of inner-layer corner cutting - often the cube locks and not-infrequently you will get centre pieces and sometimes even edge pieces in the wrong spot and it is sometimes difficult to get them back into place. Easy enough to avoid with accuracy but on occasion can ruin a solve. Nice one to play. Seller is quick in sending the product. Thanks for this.